Geoff Bouvier’s first book, Living Room, was selected by Heather McHugh as the 2005 APR/Honickman Prize winner and was published by Copper Canyon Press. His second book, Glass Harmonica, appeared in 2011 from Quale Press. In 2009, he served as the poet-in-residence at the University of California-Berkeley. For five years, he wrote long-form magazine journalism with The San Diego Reader, publishing over 50 cover stories. Bouvier’s poems have appeared in such journals as American Poetry Review, Boston Review, Denver Quarterly, Jubilat, New American Writing, and VOLT. He holds an MFA from Bard College and is currently a Ph.D. student at Florida State University. 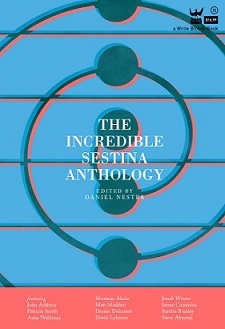 We went Behind the Sestina with Bouvier to discover how he refines the sestina in his poem “Refining Sestina,” included in The Incredible Sestina Anthology. The first sestina I ever saw was John Ashbery’s double sestina in Flow Chart. Made the traditional form seem easy. I spent about two months writing nothing but sestinas, and no, I never wrote another one before or since. What was it like writing a sestina? Did the subject matter of the sestina have an impact on the form used, or did the form have an impact on what you were writing about? Repetitious end-words are already related to echoing, so during those couple of “sestina months” (yes, that’s a thing) I wrote a lot of sestinas about echoes. After a while, it occurred to me to try to write the shortest sestina possible, so I started experimenting with words that could anagram six ways. It was a lot of nonsense. Then I tried sestinas that consisted of just the six end-words. Those were okay. Finally, when I “sestinaed” (yes, that’s a verb) whole phrases, I started to write what sounded like Bach fugues. “Refining Sestina” is one of those. Living Room, Bouvier’s first book. It’s clear that your sestina’s form differs from what we are used to seeing. The word “redefining” has something to do with it, certainly. What led you to write the sestina in this way? For about 10 years, I wrote nothing but prose poems. I didn’t consider any poem “finished” until I’d transposed it into the standard sentences and paragraphs of expository prose. For a while, I worked my way through experimenting with prose sonnets, prose villanelles, prose pantoums, prose sestinas, what-have-you. The conversion into prose of what I’d already thought of as a redefinition of the strict sestina form completed my little experiment. The first sestinas were always dedicated to someone—who would you dedicate your sestina to? My sestina is a paean to sestinas themselves, albeit a refining one. This entry was posted in Uncategorized and tagged Bard College, Behind the Sestina, Copper Canyon Press, Denver Quarterly, Geoff Bouvier, Heather McHugh, Incredible Sestina Anthology, John Ashbery, Poetry, Redefining Sestina, San Diego Reader, Sestina, The Incredible Sestina Anthology. Bookmark the permalink.